This article attempts to describe the vowels of British English (BrE) as they are, rather than as they’re implied to be by the most familiar dictionary symbols. The article has been taken by some as a bid to change the way a variety of English is transcribed. But in fact its main aim is to describe the differences between two varieties: the older prestige variety for which the familiar symbols were chosen (most often called ‘RP’) and the southern British variety which serves as a standard today. Clearly, the old symbols for RP are so established in EFL publications and the internet that we will be working with them for some time to come; but users of them should be aware of the actual sounds they correspond to now. Phoneticians describe vowels by use of reference qualities or ‘cardinal’ vowels which map out the auditory vowel space. As systematized by Daniel Jones, there are eight primary cardinals. These were conventionally plotted on a quadrilateral according to the estimated positions of the tongue body in the mouth (with the front of the mouth to the left). Here is Jones’s quadrilateral, along with a triangular arrangement corresponding more closely to acoustic reality, with demonstrations recorded by Jones himself, starting with the first cardinal vowel i and running anticlockwise to number 8, u. Sometimes we encounter less common vowels which require symbols other than the primary cardinals. For example some languages, including French and German, have contrastive rounding of the non-low front vowels. For these, phoneticians turn to a ‘secondary’ set of cardinal symbols, eg y, the rounded counterpart of i. And occasionally phoneticians feel the need to use entirely non-cardinal symbols to capture more idiosyncratic qualities. The old prestige accent RP (Received Pronunciation) as classically described in the mid 20th century had a vowel system which was large and phonologically rather disorganized. To transcribe it, A. C. Gimson chose IPA symbols comprising most of the primary cardinals, two secondary cardinals ɒ and ʌ, plus the non-cardinals æ, ɪ and ʊ, and the neutral vowel schwa, ə, which belongs in the centre of the vowel space (a further symbol ɜ was added for schwa’s long counterpart). It’s important to understand that Gimson chose these IPA symbols as ‘explicit’ descriptors of upper class speech circa 1962. Pronouncing them with their precise IPA values today gives a sound which is remarkably old-fashioned to contemporary ears. I’ll now discuss these vowel qualities, paying attention to points of divergence from RP, and making one or two minor modifications. A comparison of SSB vowels with those of RP indicates what can be thought of broadly as an anticlockwise vowel shift. This had three distinct components: lowering of the front vowels, raising of the mid back vowels, and fronting of the high back vowels. The first two of these components are plausibly attributed to the fact that RP had crowding towards both the upper front area (FLEECE, KIT, DRESS and TRAP all being non-low) and the lower back area (START, LOT, NORTH and STRUT all being non-high). These two areas of crowding required the use of, respectively, two non-cardinal symbols ɪ and æ, and two secondary cardinals ɒ and ʌ, all four of which tend to be problematic for foreign learners. The START vowel, however, has been relatively stable, displaced neither by the de-crowding of the upper front area nor that of the lower back area. Cardinal 5 ɑ remains an accurate description of it; it is of course a long vowel, ɑː. the results are more or less equally acceptable. Incidentally, transcribing SSB LOT as ɔ reinstates Daniel Jones’s practice: “In broad transcription of particular languages it is generally convenient to use the symbol ɔ in place of ɒ” (Outline of English Phonetics, 1962). Perhaps Jones found that the symbol ɒ caused confusion among foreign learners commensurate with its oddity and scarcity in the world’s languages. Today, describing SSB LOT with the more natural ɔ is no longer mere convenience. But in fact it’s a German speaker saying Ton and Dom. As in RP, the NORTH vowel also functions as the first element of the CHOICE diphthong. Here from a 1945 newsreel is RP voice, followed by its beginning, vɔ. And here is contemporary voice from the online Macmillan dictionary, again followed by its beginning, vo. Once again, evidence from smoothing confirms that CHOICE begins with the NORTH quality. A sequence of CHOICE and schwa may optionally become a lengthened version of the diphthong’s first element. Here is telecoms honcho Richard Hooper saying the finances of the Royal Mail need to be stabilized with ɹojəl mɛjəl smoothed to ɹoːl mɛːl. This is a basic part of English phonology; failing to observe it is a glaring but routine characteristic of non-native speech, even with advanced learners. For example, foreigners tend to pronounce initialisms like B.A. or U.R.L. as BʔA and UʔRʔL rather than the native pronunciations, BjA and UwRɹL. So in SSB, the upper corners of the vowel space function as the endpoints of its two subclasses of diphthongs. I prefer to transcribe them as the semivowels j and w, which are exactly equivalent in terms of the vowel space, but have additional benefits. First, j and w make explicit that the English diphthongs are falling, ie moving from greater to lesser prominence. Second, they reinforce English vowel linking for the foreign learner, eg way out wɛjawt, show off ʃəwɔf, as well as initialisms like those in the previous paragraph. Additionally, they provide by far the best way to teach cardinals 1 and 8 to native English speakers: simply pronounce intervocalic j or w, then “hit the pause button” in the middle of the semivowel. Of course, in the less accented contexts of continuous speech the contemporary j and w endpoints will often not be reached. This kind of target undershoot is a universal phenomenon in running speech. In narrow phonetic terms, the start of GOOSE is usually a bit closer than the FOOT vowel, and the IPA symbol ʉ exists to denote this; however, I’m not aware than any language contrasts ɵ and ʉ, and for that reason I consider ɵw and ʉw equally acceptable transcriptions of SSB GOOSE. Certainly the widespread transcriptions ʊ and uː are fossils as far as contemporary SSB is concerned (though the ʊ of kaputt of course survives in the north of England and in Australia). I commend those Germans (and others) who trust their ears more than their dictionaries, and use their ü rather than their u when speaking English. The fronting of FOOT and GOOSE may well be due to the raising of LOT and NORTH. It may also be associated with the inexorable rise of l-vocalization in southern England. This not only creates new w-diphthongs, but in its syllabic form also creates a new high back rounded vowel in words like hospital and model, arguably helping to push FOOT and GOOSE forward. I think I got those demonstrations in the right order; frankly I find it hard to tell them apart. The KIT vowel is probably no further from cardinal 2 e than the START vowel is from cardinal 5 ɑ. So from a phonetic point of view it would make perfectly good sense to use e for the KIT lexical set, and this would be supported also by its frequent correspondence in unstressed syllables to orthographic e, as in wanted, between, knowledge, decide, basket, glasses, etc. But the potential for confusing foreign learners is perhaps too great. So, for practical rather than phonetic reasons, it’s reasonable to continue using the special non-cardinal symbol ɪ for KIT. The FLEECE diphthong is a narrow one, but when pronounced emphatically it can certainly be heard in its full form, ɪj. Here is Kate Winslet’s me again, followed by its first part, audibly ɪ. 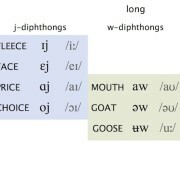 Like all diphthongs, FLEECE is liable In continuous speech to be compressed towards a monophthong. But foreign learners should practice its full form; Germans, for example, should definitely avoid using their iː for FLEECE. I explored the mid and lower central area of the vowel space at considerable length in another post. Schwa ə is at least as key to the sound of SSB as it was to that of RP, occurring not only as the ubiquitous pause vowel, but also across the lexical sets commA, NURSE, GOAT and STRUT. Many will prefer to give STRUT its own position in the vowel space, lower and/or backer than schwa (but hard to pin down since it is so variable). In strict phonemic terms, however, STRUT and commA are not truly contrastive, so no confusion is caused by pronouncing them similarly, as millions of British and American speakers do. On the other hand, learners who aim for a distinctive, more peripheral STRUT risk confusing it with TRAP, START or LOT. Acquiring a good schwa is a vastly higher priority, and learners are far better off saying Pizza H[ə]t than either Pizza Hat or Pizza Hot, which are the usual errors of those striving after the mercurial grail of “ʌ”, a chalice not of silver but quicksilver. In SSB, NEAR words and the surviving PURE words are widely “varisyllabic”. In strongly accented phrase-final position, they’re sometimes heard as sequences of FLEECE/GOOSE + schwa, ie ɪjə and ʉwə. More generally they tend to be heard in the ‘smooth’ monosyllabic forms ɪː and ɵː. In less strongly articulated positions, the smooth ɪː and ɵː predominate in SSB (remembering, of course, that the PURE set is dwindling). What’s clear is that the centring diphthongs of RP are decreasingly heard as such in SSB, and that a distinctive lexical set of PURE words is becoming marginal. Here, then, is a slightly modified vowel space for SSB: And here are the vowels listed by lexical set, cross-classified, with a commA-STRUT distinction and, where different, more familiar Gimsonian symbols between slanting brackets: To sum up. The vowels of SSB are spread more evenly around the vowel space than RP’s were. They employ fewer qualities, and fewer non-primary qualities, making them easier to learn. Each of the short vowels except LOT (and, if distinct, STRUT) functions also in the long vowel system, which was not true of RP. The long vowels of SSB fall into three phonological classes according to linking behaviour, an increase in pattern regularity compared with RP. RP’s set of centring diphthongs is no longer needed. Daniel Jones happened to codify the empire’s upper class speech during a phase of considerable phonetic unnaturalness. The social authority of the accent, and the scholarly authority of Jones’s and Gimson’s description of it, enshrined and perpetuated that description throughout and despite what has ironically been a period of quite exceptional sociophonetic change – change that was driven by shifts in British society and culture, and perhaps also by the very unnaturalness, and hence instability, of RP itself. Today we can still identify a relatively prestigious accent which will serve those foreign learners who want a British model. This contemporary BrE accent, described above, embodies various developments away from the relative unnaturalness of RP; quite aside from the desirability of recording contemporary speech accurately, it makes overwhelming sense to avail foreign learners of this greater naturalness. Superb. Thank you very much. One question though: what do you think of ɵ as the endpoint of GOAT? Thank you! Yes, there are certainly speakers who say GOAT, MOUTH and GOOSE with an endpoint further forward than [w]. Some even have a pronunciation of no that it sounds like nay. For any given accent we should check out how these vowels are pronounced before silence, and before another vowel (e.g. so angry, how angry, too angry), since vowel liaison is such an important part of English. 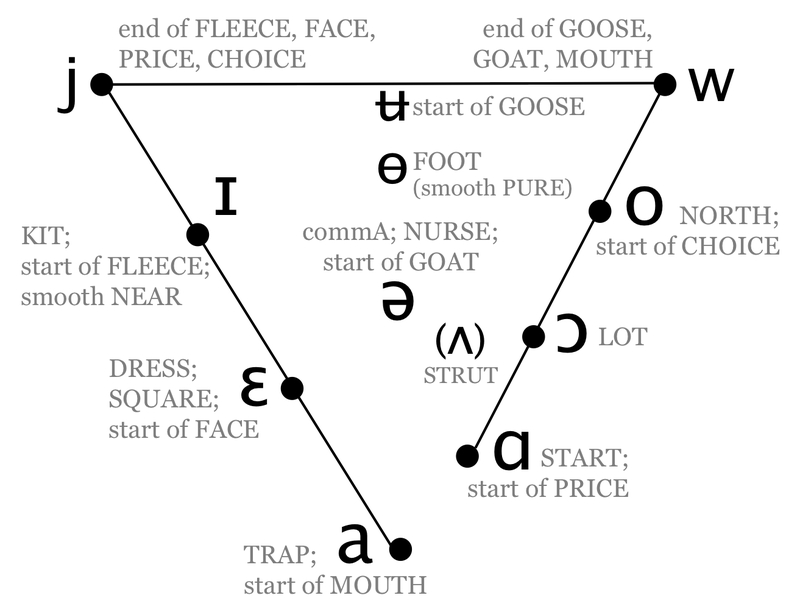 I think the pronunciation of GOAT, MOUTH and GOOSE with a [w]-endpoint is standard-sounding, as well as useful for encouraging good liaison in learners. All sources now filled in. Great post. Can you address this topic in your future posts, since you work with actors, accents, dialects? This is about resonance, tonality, mascularity of accents. For instance, David Alan Stern talks about American Accent being Mid-mouth resonance, British accents being more frontal. Is this resonance aspect related to how vowels are placed? Or is it about consonants? Concerning the use of double vowels rather than the length mark, I agree that this makes it more difficult for EFL learners to ignore it, but I’m not entirely comfortable with it. Are they really bimoric? And long vowels usually aren’t twice as long as short vowels, and the length mark looks more open to variety. I commend those Germans who trust their ears more than their dictionaries, and use their [short?] ü rather than their u when speaking English. Bold – and very reasonable. In English a minimal word is bimoraic, e.g L [ɛl], A [ɛj], air [ɛɛ]. This is obscured by a diacritic which merely indicates a modification to the vowel segment with which it is associated. I don’t recall many folks fretting over whether R.P. diphthongs lasted the sum of the durations of their component vowels! But for what it’s worth, I’ve measured the vowels of ken and cairn from the online Cambridge, Macmillan and Oxford Advanced Learner’s dictionaries: average for ken 0.15s, for cairn 0.29s. Though I don’t feel much the wiser! I first noticed Germans using short and long ü for FOOT and GOOSE while on a school exchange in 1973. These teenagers were presumably copying pop records rather than their teacher, whose u even then sounded old-fashioned. I agree that this is an excellent post and one with a lot of good ideas. One of the few assertions that you didn’t back up with an audio was the change in the CHOICE. This is one that I have not noticed. The vowel in CHOICE dosn’t vary as much across Britain as all the others do, so I think that my brain has not evolved to pay attention to it. I’ll try harder from now on. Even if it’s not changed, I can understand from an EFL perspective why you’d keep its first element the same as for THOUGHT just to simplify matters. P.S. Just had another thought. Do you think that there’s any similar advantage from updating the notation of consonants? I wonder sometimes whether it’s worth it for foreigners to learn the two “th” sounds. These are rare sounds in world languages and many learners spend hours trying to master them, yet they are in steep decline in England and may be gone by the time that I am an old man. The consonant inventory is a lot more stable, but this post has generated some interest so I’ll consider another one on the consonants in general. The two “th” sounds are under attack in terms of place and manner, but the voice contrast between them is robust . Many people now say think as fink, but they don’t say then as fen. If a foreigner has insuperable difficulty with dental fricatives, personally I’d recommend they use native alternatives like fink rather than non-native ones like sink. Thanks for adding that. I’ve realised that I have the old-fashioned [ɔj]. This would be a much better post if you stopped referring to the accent you’re describing as “Standard British”. Perhaps that’s me being a picky scot but there you go. Hi Anonymous. I think you have a valid grievance; but it’s a shame if nomenclature really diminishes the worth of this post for you. What I’m describing (not prescribing) is the phonetics-phonology of something known around the world, for better or worse, as “British English.” (Compare the use of “American English”, which, as everyone knows, is not the English of all Americans.) The qualifier “Standard” is to differentiate it from the British Englishes I’m not describing: the accent in question is, for better or worse, a standard for foreign learners (chiefly those not aiming at an American standard). Scots might very reasonably prefer “English English”, which I’d be happy to endorse, but (1) to some extent it does the same disservice to Geordies, Brummies, Scousers etc. that “British English” does to the Scots, and (2, more importantly) it’s not now and is unlikely to become common usage; it sounds like a disfluency and looks like a typo. I’m happy to use “SSB”, which incorporates “Southern” – thereby reducing the pissed-off brigade chiefly to those in the West Country – but again it’s unlikely to supersede “British English” in international usage. So I’m using (not advocating) terms that are not ideal but are “out there”. What I do advocate is trying to treat the data accurately and insightfully (observational and descriptive adequacy, as Chomsky termed them). Phonetic blogging seems worthwhile because of its multimedia capabilities – the possibility of incorporating actual speech sound data, to which labels (and transcriptions) are secondary. I’ve tried to show how the accent in question has a sound system which is different from, and more natural than, that of classic R.P., although widespread transcriptions imply misleadingly that the latter is still current. At least one Scottish academic (who uses the terms “English English” or “Anglo-English”, sensibly for a Scottish context) tells me he’ll be recommending the post to his predominantly Scottish students, so they can hear the facts – which I hope are not invalidated by the labelling. What you have said about [e] and [ɪ] made me wonder whether there are languages that really oppose the two (since the IPA supposedly only uses distinct signs where an opposition exists in some language). I know that there are Americanist transcriptions of English that use simple signs for most vowels (/i/ for FLEECE, /ɪ/ for KIT, /e/ for FACE, /ɛ/ for DRESS etc.). To my knowledge, however, this is not a true opposition between [ɪ] and [e] by vowel quality alone. FACE is a free vowel and KIT is a checked vowel, so they are distinct by more than just vowel quality. If the sign [ɪ] were not available, they could be transcribed easily in some other way. I have looked through Ladefoged and Maddieson’s Sounds of the World’s Languages. They have no example of an opposition between [ɪ] and [e]. Would you by any chance happen to know of such examples? I don’t know any such examples. As I understand it, there is always a difference of length and/or of so-called advanced/retracted tongue root. It wouldn’t surprise me if there were some varieties of Western US English (maybe Sarah Palin’s?) that distinguish FACE from KIT purely by quality as [e] vs. [ɪ]. I believe, from memory, that the “California English” article in the IPA handbook represents the distinction in this manner. As a California resident myself (but not a native speaker) I’ll try to listen out for it. There are indeed some words, such as “day”, where the KIT/FACE distinction is neutralized. However, that does not mean that there is no meaningful distinction between the two lexical sets: minimal pairs, such as “bit”/”bait”, are plentiful. As a native speaker of (Northern, Bay Area) Californian English, I can tell you that the vowel of face is not quite a monophthong. It’s a diphthong, though not nearly as dramatic a one as in British English; it begins closer to a mid front vowel, has a slight upglide, and it is quite distinct from the vowel of kit. The vowel of Sarah Palin’s English (which sounds to me most like Minnesotan, or “midwestern” (terrible term, by the way – ought to be called central US), though perhaps it’s Inland North) may well be a monophthong, but please don’t lump her in with Californians. Sorry, I meant to reply to dw. Or I did? 😀 Sorry, unfamiliar with this GUI. To me, her “ate”, “face” and “name” sound fairly like “it” “fiss” and “nim”. I think her KIT differs from her FACE mainly in being more central. Thanks, Len. I’m trying to resolve this. But, wait. Something is unclear. When you mention RP as a thing of great beauty, which RP are you talking about? How is that RP different from what Daniel Jones codified? No difference was intended – when I refer to “R.P.” I mean essentially a single system, as described by Jones and others in the early-to-mid 20th century. I personally find this accent old-fashioned but aesthetically pleasing, just as many people find old steam trains beautiful, or are nostalgic for the old British money with its shillings and half-crowns and guineas. But it’s a matter of taste: many people today find the sound of R.P. not so much beautiful as silly. Although some people (NOT including me) refer to it as if were still the standard accent of today, “R.P.” is inextricably tied to the upper class speech of the early-to-mid 20th century. Vowels of that social class and that era which are no longer standard, e.g. [eə], [aɪ], [ʊ], [ɒ] and [ɔː], are still employed in the transcriptions of today’s dominant dictionaries. I think this is somewhat unhelpful both to non-natives who are learning Standard British English and to British natives who are learning phonetics. Furthermore, I think it’s objectively true that the R.P. 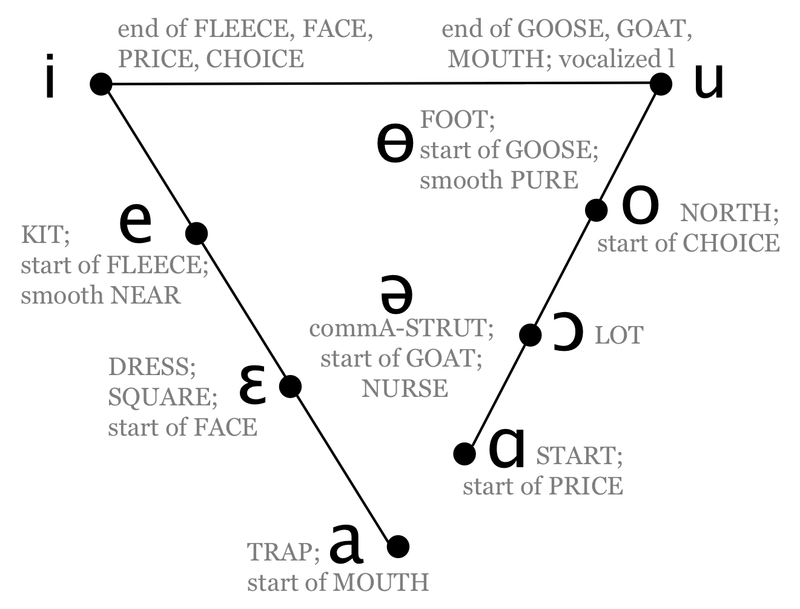 vowel system was relatively unnatural and therefore relatively difficult to learn, somewhat like the old British money system. Whether R.P. was beautiful or not, I think learners can and should benefit from the greater naturalness of the contemporary system. Thank you! That was a beautiful reply. When I read your comment about Jones’s codification, I had in mind that you meant a difference between, say, the English spoken from 1850 until 1900 and the English spoken in the 1930s, for example. Which is why I’d like to know what are these subtle differences one most definitely hears while listening to Brian Sewell, Noël Coward or Clarissa Dickson Wright. Or, say, between Clarissa Dickson Wright and a duchess from the end of the 19th century. All are upper-class speakers, but there are differences. Can these differences be described and thus replicated? Ending the comment, I would just like you to confirm that the starting point of the SQUARE diphthong for that older type of RP is a closed vowel, [e] (and not [e̞ ] nor, most definitely, [ɛ])? Thank you for this very interesting description of standard British accent. I’m Italian but I lived five years in England. I’m no expert but I do have a passion for linguistics and phonetics in particular, which can be perhaps described as a “serious hobby”. Now, your approach in this description rationalises a lot the English vowels and matches, at last, the phonetic description with what I hear in speech. Phonetic transcriptions of most dictionaries have been mostly quite unsatisfactory on the matter for me so far, even authoritative ones. There is only one thing I disagree with in your description: the FACE diphthong. As you know, Italian as both [ɛ] and [e] as separate phonemes and both may form a diphthong with [i]. So we have the distinction between [dɛi] meaning “gods” and [dei] which is preposition+article meaning “of the”; this distinction is very clear and using the wrong pronunciation would immediately give away a local accent. My point is that the when I hear the “day” in English I can’t really match it with “gods” in Italian, it sounds like “of the”. Craig’s “day” and, perhaps more clearly, Clegg’s “pay” start with vowels sounding to me closer to [e] and rather higher than those of “fair” and “share” in Clegg’s speech. What do you think? Is my italian-tuned brain straining a marginal objective difference towards two separate phonemes? Or are we still in a transition phase where that first FACE vowel lingers between [e] and [ɛ] with the exact quality depending on the (standard) speaker and the phonetic environment? Thanks for the kind words, Stefano. Your ear is good and your observations on FACE are interesting and valuable. I think that BrE ɛj overlaps with Italian ɛi but is often rather different. Google Translate’s current pronunciation of Italian sei ‘six’ (which I understand has ɛj rather than ei) sounds very like BrE say, but like you I often hear such forms as different. In citation form, with a nuclear accent, it’s long and clearly diphthongal, [ɛj]. However, most of the time this word is unstressed, as in When are they coming?, in which case the vowel will be much shorter and less diphthongal, something like [e]. I’m sure that this potential for the FACE diphthong’s trajectory to ‘contract’ is not restricted to the word they. Probably this accounts at least partly for your perceptions that it more closely resembles Italian ei. However, I’ve long thought about the at present very prominent vowel changes before (historic) dark /l/. Since the r-vowels /ɛː/, /ɪː/, /ɵː/ are treated as individual phonemes (rather than allophones), shouldn’t the l-vowels be treated as individual phonemes as well, like /uː/ or /uw/ as opposed to /ʉː/ and /ɔʊ/ as opposed to /əʉ/? For many younger people in Britain the prime difference in pairs like pool/pooh, tool/too, cool/coo is the vowel quality rather than the prescence of a classic dark /l/. And the vowel quality of ‘shoe’ is strikingly different from that of school. The kaputt vowel is, I think, perfect in ‘school’ but outdated in ‘shoe’… From a teaching perspective, it would be easier to regard the two sounds as separate phonemes. If a foreigner asked an Englishman to ‘remove the p[u:]’, it could easily be misinterpreted at least if the ‘remove’ vowel is appropriately centralised or fronted… Also, vowel in ‘feel’ (something like [iə]) is quite different from feed [ɪi] at least the speach of younger people. I’ve listened to quite a lot of British broadcasts and these ‘l-vowels’ seem to be firmly established in present day-English at least when it comes to younger people. Are the two FOOT audio files missing? Interesting that the function of this system can be more easily mapped to the General American one than the previous RP, which I sometimes stuggled to follow in transcription. Obviously many of the precise values are slightly different, but other than GA’s rhoticity and merger of this system’s /ɑ/ and /ɔ/, it’s fairly functional for me. Perhaps this says something about the likely structural outcome of mixing the various regional/class dialects into nationalized varieties.